Genelia D’Souza just showed us how to make your boy fall in love with you all over, again, by gifting a posh Tesla SUV to Riteish Deshmukh on his 40th birthday. Riteish Deshmukh and Genelia D’Souza undoubtedly make a cute couple who we all adore. Whenever we see this couple together it just give us the feeling as if they are only just married couple. The way Riteish calling Genelia as ‘baiko'( means wife) is all about rekindling romance in this rush hour of life. 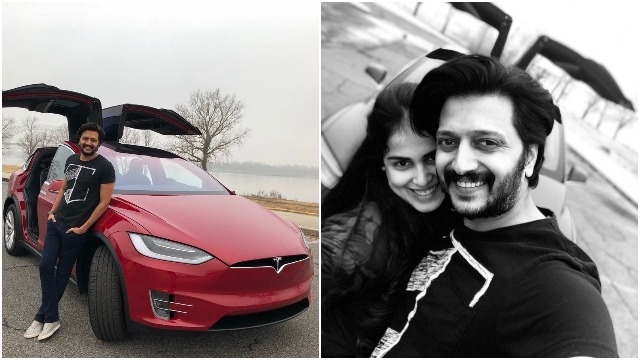 Well, as if their strong loving bond wasn’t enough, Genelia raised the bar of love by gifting a swanky Tesla SUV to hubby Riteish Deshmukh on his 40th birthday. I bet, nothing on this planet can beat the love for gadgets and cars a boy has. Genelia bowled her husband Riteish by presenting him a hot red electric tesla SUV car on his 40th. Riteish Deshmukh, who celebrated his 40th birthday on Dec 17, received innumerable birthday wishes, but its his wife who won his heart. In response, Riteish wrote the sweetest message for his wife, “I hope I am doing exactly the same thing I did in my past life to have deserved you. Coz I definitely want you in my next. The rough estimated cost of Tesla SUV model cars is anywhere between 80,000 – 90,000 USD. You know now how much it can cost you in INR now. Riteish Deshmukh and Genelia Deshmukh married on February 3rd, 2012 and parents of two charming sons. Previous : Hichki Trailer: Rani Mukerji’s Comeback Film Will Teach Us How To Overcome Weakness! Next : Aiyaary Trailer: Officer Sidharth Malhotra & Manoj Bajpayee’s Powerful Act Proves It’s a No-Nonsense Thriller!